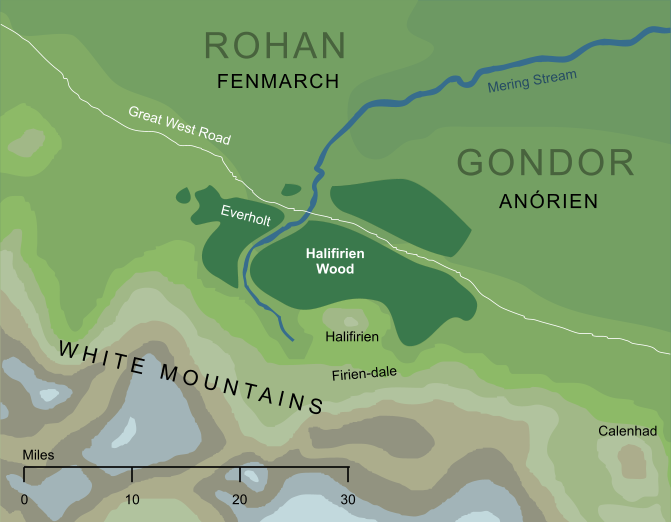 A wide expanse of woodland that grew beneath the beacon-hill known in Rohan as the Halifirien, on the border between that land and Gondor. It took its name from that peak (Halifirien translates as 'holy mountain'), though in common use the forest was more usually referred to by the shortened forms 'Firien Wood' or 'Firienholt'. For the most part the trees of the Halifirien Wood spread out northwards into the plains, but a wooded valley, the Firien-dale, ran to the south of the Halifirien, between the hill and the main mass of the White Mountains behind. Original content © copyright Mark Fisher 2010, 2013, 2019. All rights reserved. For conditions of reuse, see the Site FAQ.